Another dexterity game that looks like tons of FUN !! 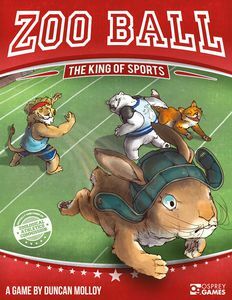 Zoo Ball is a flicking game with a giant fabric playing mat and customizable teams in which tactics are as important as skill. Face the roar of the crowds, grit your fangs, and prepare to become the king of sports. Push all three defenders to clear a path, or just push your scorer to go for goal. Play head-to-head, or in a four-team free-for-all. Customize your teams as much as you like. That's it. You're ready for the Zoo Ball!